Unforgotten Blog Tour: Interview with Jessica Brody! “When Freedom Airlines flight 121 went down over the Pacific Ocean, no one ever expected to find survivors. Which is why the sixteen-year-old girl discovered floating among the wreckage—alive—is making headlines across the globe. I’m so excited to have been able to Interview Jessica Brody! I’ve had the opportunity to meet her and she’s super sweet and very nice so that made me even more excited to be able to share an interview with her today! Brittany: There were lots of surprising twists and turns in Unforgotten! Did you plan most of them or did some of them take you by surprise as well? Jessica Brody: Thank you for saying that! I love surprising readers! So…mission accomplished! I did plan most of them, but like with every book, things popped up that I wasn’t expecting. There’s a new character in this book that I’d always planned on adding but many of his scenes and dialogue and characteristics were surprises to me. When I started the book, all I had in my notes was: “Enter character” and that was kind of it. He came alive to me as I wrote. B: I love that this book dug even deeper into the science-fiction aspect of the series. Was it hard to imagine and invent all of the new technology that Sera and Zen encounter? JB: Oh, just wait until book 3! There’s SO MUCH MORE fun technology!!! Hard? Yes. Fun? Definitely. Most of this book takes place in the year 2032, which is only 18 years from now. So coming up with that world was really challenging but also entertaining. I basically looked at all the technology releasing today and then just took it up a notch. I think the technology I’m looking forward to the most are the cars that drive themselves. Many experts say we are not too far away from this. And I can’t wait. It’ll be like having a private chauffeur everywhere I go! B: I absolutely loved the ending and felt like all of the pieces of the puzzle fit perfectly back together to form one incredible fact and really brings the entire series together! Was it hard to get the details to all fall into place? JB: YAY! That makes me so happy to hear you say that! This book was such a complicated, jigsaw puzzle of memories (both real and not real), time periods, facts, and events. It was SUCH a hard book to write. So much of what I thought would work, didn’t end up working. The hardest aspect was keeping track of everything Seraphina remembered and everything that was erased from her memory. As the author, you have to know both, even if your character doesn’t. It was a mind meld! If you want a challenge, write a book that has memory manipulation and time travel. B: Do you have anything special you do to help you out if you hit a writing roadblock? B: Did you have any specific inspirations for the Unremembered trilogy — either the characters or the concept? JB: Actually, yes! The middle of this book was the hardest part for me. I got through it by taking long walks and listening to one song on repeat. “Treacherous” by Taylor Swift. That song perfectly sums up the relationship between Seraphina and a certain character I can’t really talk about. I must have listened to that song at least 200 times while writing this book. Every time I couldn’t get a scene right, I would go for a walk, put the song on repeat, and just let my mind wander. So, thanks, Taylor Swift and whoever broke your heart this time! B: It looks like the Unremembered trilogy is your first published set of books that aren’t contemporary! Was it difficult to write a different genre? JB: I think every book I write is the hardest book I’ve ever written. Because if I’m not challenging myself to be a better writer, then the book isn’t worth writing. But I will say that UNREMEMBERED, UNFORGOTTEN, and Untitled book 3 were MUCH harder than my contemporaries. Not only because they were sci-fi and therefore required more unique world building, the creation of new technology and all that, but also because this is my first trilogy as well. My other YA titles have all been standalones. There’s something really nice and fulfilling about writing a standalone. You start the book, you finish the book. You say goodbye to the character and move on to something else. Writing a series is a whole different animal, because there has to be a really good reason why this character’s journey can’t be wrapped up in one book. And that makes her journey so much more epic and complex, which can be a daunting task at times. But now that I’ve just finished writing book 3, I can say, the hard work is well worth it. It was a roller coaster ride of a project but I’m proud of what’s come out of it and I can’t wait for everyone to read the final ending! 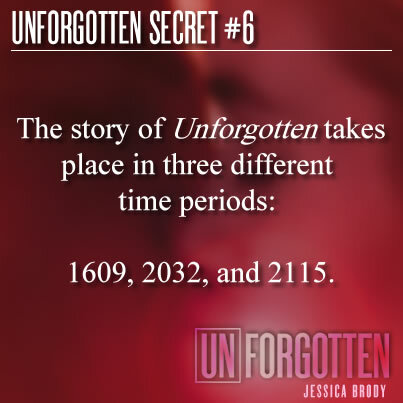 Become a fan of Jessica Brody and the UNREMEMBERED trilogy! Visit the links below to connect with Jessica and find out more info on the series! Follow Jessica Brody on Twitter! See Jessica Brody on tour! Read and download the first five chapters of Unremembered for free! Read and download the first five chapters of Unforgotten for free! 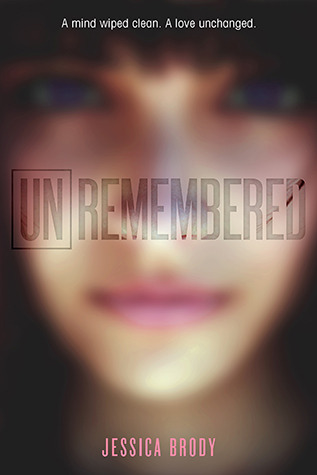 Check out the Unremembered book trailer! Want Unremembered Series Goodies? Participate in Jessica Brody’s Unforgettable Fan Challenge! Plus an Unforgotten Preorder Offer! Read Undiscovered, an Unremembered series e-short for only $1.99, and it’s from Zen’s point of view! Blog Tour: Unchanged by Jessica Brody | Q&A + Giveaway! Unforgotten (Unremembered #2) – Jessica Brody Unchanged (Unremembered #3) – Jessica Brody NIL Blog Tour: Interview with Lynne Matson! This entry was posted in Author Interview, Blog Tour, Books, Sci-Fi, YA and tagged Author Interview, Blog Tour, Books, Interview, Jessica Brody, Macmillan, Sci-Fi, Science Fiction, Unforgotten, Unremembered, YA, Young Adult on February 24, 2014 by Brittany. I need to read a Brody book & get on the fan-wagon. I have got to read this series! It’s on the TBR list. I MUST get to it! I just got the first book for cheap for my Nook so I’ll be checking out this series sometime!